Technology has become a part of our everyday lives, with smartphones being the center of our lives. They carry our photos, emails, music and with millions of apps to choose from they also help with our banking, entertainment, they can even start our cars! So why not let the little device make your wedding planning a little easier? Appy Couple, a new wedding app, can replace the traditional wedding planning methods, like building your own Web site, with an app for the tech-savvy, fast-moving and multitasking bride. You can stay in touch with your guests and organize events from your iPhones, iPads and Androids. Appy Couple focuses on creating an interactive experience where the bride and groom can communicate with their bridal party and other guests. 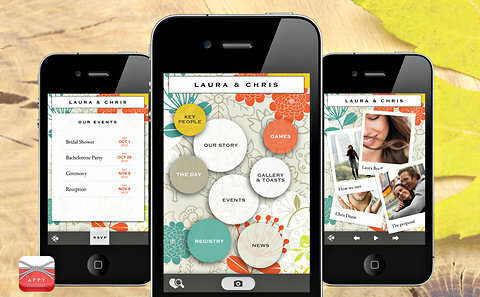 Using AppyCouple you can create a custom wedding app that matches the tone and motif of your wedding. You can include the story of how you met, engagement photos and special songs. A free coordinating Web site included with each custom app displays the same content as the app, and can be used by guests who don’t have a smartphone, or are not as tech-savy! Once the app has been created, you can enter your guest list manually or upload it from a spreadsheet, and invite family and friends to access the app for free, using a special code. Each guest will then have access to information, including wedding events, dates, locations, travel accommodations and last-minute changes. There is also a privacy function that allows the bride and bridegroom to select certain guests, like members of the bridal party, to receive private messages. All content, including messages and photos, upload in real time so guests and members of the bridal party can stay up-to-date (if they choose). Guests can also upload their photos and post messages and toasts on the couple’s message board. The fun part is that event If guests can’t make it on your big day, your wedding Web site will live-stream photos to your customized application! Appy designs start at $49 and there are currently 100 designs to choose from!